In case you missed it here is the update in full including the stuff from Camerons we put out in connection with Cameron Service Bulletin 23 on the 7th January 2016. Please note however that following inspection of (so far) 12 valve assemblies (more currently due), and that it is not mandatory, we have now updated our advice. 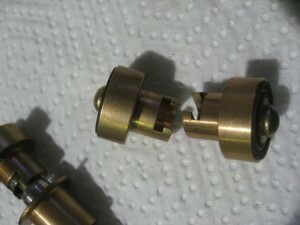 Please see 'From the workbench - Lindstrand Toggle Valve update' which follows on from this lot. If you’ve already read the News Update 07.01.16 then skip straight past gaol don't get £200 and start from ‘And Now for the Proper News’. Cameron Balloons have issued Service Bulletin 23. This refers to the Lindstrand Toggle Valves and possible wear to the seat carrier which could result in the stem falling out and an uncontrollable escape of propane. The SB is Highly Recommended and should be carried out at the next annual/100hour inspection. This means that you need not get the inspection done until the next inspection falls due (even if you have just had one done) and it is not mandatory. Squeeze action valves are not affected. A mod kit has been produced. We would suggest that the inspection is of value and that in the interests of safety it would be sensible to fit the mod kit however, this does not have to be done immediately and again re-iterate that the inspection or the fitting of the kit is not currently mandatory. Interestingly Camerons state that ‘At present there is no evidence of significant wear in the system’. We have never heard of a such a failure however a similar potential fault (which did include a failure) occurred with Thunder and Colt and Sky burners (reference Cameron Service Bulletins SB01 and SB10). Cameron Balloons have told us that this is a one-time inspection to ascertain if a problem does exist and to gather data to see if further action is needed. If excessive wear is found then the Service Bulletin may be raised to an Airworthiness Directive. If the modified parts are fitted then no further action will be required if it does become an Airworthiness Directive. If you do strip down the valve assembly the seals must be replaced and, although not mentioned in the SB, we would advise that whilst the valve is apart the seat carrier ought to be replaced even if it is deemed serviceable. The seat carrier is not included in the mod kit as it has not been modified so needs to be ordered separately. As a matter of course we replace the seat carrier as part of the service to the valve so if we have carried out work to your Lindstrand burner valves then the affected component would have been replaced and the details entered in the logbook. Please do not hesitate to contact us for clarification. 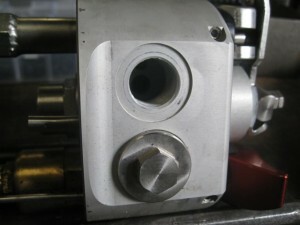 The cost of the mod kits are £37.00 (€52.00) for the short stem (whisper valve) and £39.00 (€55.00) for the main valve. The seat carrier is £15.00 (€21.00). Two long and two short kits plus four seat carriers are required per double burner. Prices are plus postage, VAT and a Form 1. In the case of the remote control burner valve £46.00 €65.00). We would estimate that it would normally take around two hours to carry out the work on a double burner. The work can be done while-you-wait by prior arrangement. If you have a Lindstrand burner then it can still be inspected in the normal way and be signed off (provided it passes) without this inspection taking place or the mod kit being fitted however, as it is Highly Recommended, if your inspector is happy to inspect the burner along with the rest of the kit but not be prepared to carry out the valve inspection then it would be acceptable to release it to service and arrange for the inspection of the valves to be carried out elsewhere. Cameron Balloons have issued a 'Frequently asked Questions' and some further information which are reproduced below. Lindstrand Jetstream Burner: Service bulletin SB23. Following the closure of Lindstrand Hot Air Balloons Ltd. (LHABL), Cameron Balloons Limited has adopted all EASA certified hot air balloons designed by LHABL. As part of our responsibilities we are required to address a possible safety issue with the Lindstrand Jetstream burner. The main and liquid fire valves of the Jetstream burner are designed so that the potential for wear exists between the valve stem and the seat carrier. If the seat carrier wears to the point of failure the valve stem can be ejected through the base of the manifold block causing an uncontained leak of liquid propane. This potential danger has already been removed in burners designed by Sky Balloons and Thunder and Colt. Cameron Balloons has introduced Service Bulletin No. 23 to address this safety issue. We have categorised the Service Bulletin as “Highly Recommended”. It calls for a one-time inspection of the seat carriers in the burner. Its purpose is to determine the extent of wear occurring in normal use and to ensure that an unsafe condition does not exist. The inspection should be carried out at the next scheduled inspection of the burner (100 hr or annual). Accomplishment instructions and a confirmation slip to be returned to the factory are included with the Service Bulletin. The results of these inspections will determine whether any further action is required. A modification kit can be purchased from Cameron Balloons which addresses the issue identified with the original design. Fitting the modified parts will remove the need for further action. Instructions for fitting these parts are included in the Service bulletin. Note: the modification kits do not include replacement seat carriers, which should be ordered separately if required. We apologise for any inconvenience that this may cause, but recommend that the accomplishment instructions prescribed in the published service bulletin are carried out as defined. Please remember to complete and return the confirmation slip as the results of your inspections are important. Qu: Why do I need to do this? Qu: I’ve had my burner for 15 years and nothing has gone wrong so far. Why do I need to spend this money now? Ans: This is a safety check of an item affected by wear in normal use. As the burner fleet gets older the possibility of this being a problem becomes greater. Qu: What happens if I choose to ignore it? Ans: If you are a private owner and you manage your own airworthiness it is your decision and you will bear any risk of not following the recommendation. If you a commercial operator you will need to discuss it with your Maintenance Organisation or CAMO. Qu: Why do I need to send an inspection report to Cameron Balloons. Ans: So that we can understand the amount of wear occurring in all burners around the world and determine whether further action is necessary. Qu: If this is a mistake in the original design, why do I have to pay for the replacement parts? Qu: What does highly recommended mean? Ans: Highly recommended is the highest category we can give the Service Bulletin. It means that we believe there is a safety concern which, if not rectified, could result in an unsafe condition. Qu: Why isn’t the seal carrier included in the Modification Kit? Qu: Do I need to change the seal carrier? Ans: The seal carrier should be changed if worn. It may make economic sense to change the seal carrier whilst the burner is disassembled. Qu: I have a Lindstrand Airship what do I do? Qu: What do I need to do if I contract my continued airworthiness management to a CAMO? Ans: They will recommend a course of action to you. Qu: I use my Lindstrand Burner with an Ultramagic Envelope, Am I affected? Ans: Yes the service bulletin is applicable to the Jetstream burner regardless of the envelope it is flown under. And now for the proper News!!! We have now stripped and inspected 12 valve assemblies and the seat carriers and found no measurable wear in the affected parts. We also understand that a batch of six burners, including the single Jetstream, were done at Camerons recently and no ‘appreciable’ wear was found in them. Measuring the wear is tricky as Camerons haven’t supplied what the measurement should be, however by comparing the old parts to a new Lindstrand supplied seat carrier we have in stock, there is barely a sniff of wear, if any. Measuring the end play between the stem and carrier with feeler gauges old and new components also showed no real measurable difference. The burners we have looked at all have in excess of 250 hours on then. Being early burners two have probably have a lot more and there was evidence that some assemblies had probably already had seals replaced in the past. We have found that, generally speaking, Lindstrand burners show signs of sticking valves or occasionally leaking seals after 250 hours. 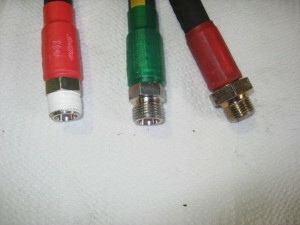 Our Lindstrand burner will return in the next week or so we’ll have a look at that. In the meantime, as the Service Bulletin is advisory, we are now telling our customers that an inspection may be advisable at 250 hours unless seals and carrier have already been replaced in which case 250 hours from then. If the results from the inspections so far are anything to go by then it seems that currently it is unlikely to become an Airworthiness Directive. Is it still a good idea to fit the modified stems? Well, if the seals need changing, for whatever reason, then yes as it won't cost much more. The Civil Aviation Authority have successfully prosecuted another balloon pilot this time for falsifying their medical certificate. 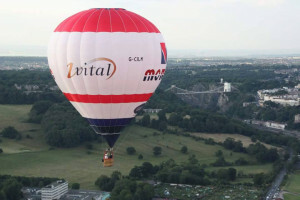 The CAA Press Release states that; ‘A self-employed hot air balloon pilot who forged his aviation medical certificates, has been fined £2,000 and ordered to pay costs, following a successful prosecution by the CAA. Appearing at Salisbury Magistrates' Court, David John Griffin admitted two counts of using a forged Class 2 aviation medical certificate contrary to the Air Navigation Order 2009, with intent to deceive. The first offence related to a period between 5 July 2013 and 6 October 2013, followed by a further offence for a period between 11 April 2014 and 27 September 2014. Following his guilty pleas at court this week (Monday 21 December 2015) Mr Griffin, 44, of Bowerhill, Melksham, Wiltshire, was fined £2000, ordered to pay CAA costs of £538, the criminal courts charge of £180 and a victim surcharge of £200. Mr Griffin's deceit was uncovered after the CAA carried out a routine audit. During this process it became clear the defendant had altered an old medical certificate, to create new forged medical certificates. It is a legal requirement for all licensed pilots to have an up-to-date aviation medical certificate. The CAA will take whatever steps are necessary to ensure aviation safety laws are fully complied with and this includes prosecution. 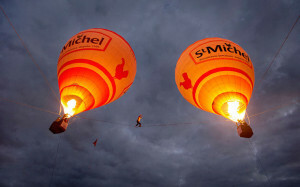 Tancrede Melet one of the "Flying Frenchies" fell to his death in southern France after he was inadvertently lifted into the air whilst preparing a tightrope walk between two hot air balloons in Drome, Southern France, on Tuesday 5th January. Well known for his death-defying tightrope walks performed all over the world from mountain peaks to skyscrapers Tancrede (32), a slackliner, BASE jumper and wingsuiter, fell 65 feet whilst getting ready to take part in an artistic project involving acrobats and was preparing for lift off when tragedy struck. One account published in Dauphiné Libéré, the local newspaper, stated that, “He was on the ground holding the hot air balloon when the craft suddenly whisked him into the air and took off,” and then wrote “He then fell 20 metres (65 feet) to the ground.” According to his fellow aerial acrobats, he fell "after being suspended at arm's length at the basket" during preparations for the stunt. Mr Melet was well known in the extreme sports world and had featured in adverts and videos, as well as in live shows and lectures. Born in Meurthe-et-Moselle, eastern France, he grew up in Herault, in the South, but had discovered the joys of the mountains in the Verdon the type of landscape in which he performed most of his stunts, particularly over the Mont Blanc massif. He was part of a group of daredevils called the Flying Frenchies, also known as the Skyliners a spokesman of which said, “Tancrede Melet, a surprising lover of life, surprised us by leaving us too soon.” Tancrede leaves behind his partner, Tiphaine Breillot, and a young daughter. We send our sincere condolences. G-CILM, a complete Z-77 kit, has been reported as having been stolen from the Normanton Golf Club, Stanley near Wakefield around January 15th. The Golf Course is convenient for the M62, M1 junction and the A1 so it is possible you may have been seen it on the motorway. G-CILM is a Cameron Z-77 CN 11877 with Lindstrand LBL 105 basket (CN BA801), Lindstrand double Jetstream 2 burners (CN BU675), 4x Lindstrand LBL V30 cylinders with red covers (CN 733, 734, 735, 736), 2x Cameron CB599 cylinders with red covers (CN 2965-1502 and 2536-1145), Lindstrand 8.0 HP inflation fan, full tether kit, quick release, instruments, all in very distinctive Weymar twin axle balloon trailer (CN 222127/uun218). 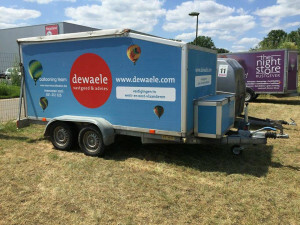 If you are offered any of the balloon components or the trailer or see it advertised either nationally, locally or on line or seen the trailer in your travels please contact Martin Axtell on +44 (0)778 - 6622802. Couple of radio related items that we didn’t put in last time on account the information was a bit confusing and the links failed to work but it appears that firstly the CAA have issued an exemption from the requirement to hold a Flight Radiotelephony Operator Licence but only if communicating with the balloon ground crew. Basically it means that you can talk balloon to ground (still not sure if it works the other way around) without a RT Operator’s Licence. The CAA state that; ‘This exemption applies to any person acting as a flight radiotelephony operator on a UK Registered balloon. The provisions from which the specified persons are exempt are articles 50(3) and 50A(1) which state that a person must not act as a flight radiotelephony operator of an EASA aircraft or of a non-EASA aircraft that is registered in the United Kingdom, including an excepted aircraft, without holding a flight radiotelephony operator licence granted, converted or rendered valid under the Air Navigation Order in order to act as a flight radiotelephony operator within the United Kingdom. The condition applying to the Exemption is that the person acting as the flight radiotelephony operator does not communicate by radiotelephony with any air traffic control unit, flight information unit or air/ground communications service unit. Details can be found at http://publicapps.caa.co.uk/docs/33/1136.pdf. Icicle Unfrozen - What a shower! Well it has to be said that despite the best efforts of the weather to completely thwart the 1st Icicle Unfrozen it was an outstanding success with a very good turnout and not a few balloonists actually bringing along a balloon despite the atrocious forecast. As it happened, late Sunday may have even been flyable but the state of the ground would have made retrieve problematic at best, that’s assuming you were allowed on the land! Donnington Grove Country Club pulled out all the stops and couldn’t do enough to ensure the event had the best chance to succeed and succeed it did. Quite amazingly they even permitted the customary and iconic Bacon Butty Van to set up outside and cut the grass on the proposed launchsite (in December!!!!) The onsite accommodation was reported as very nice by all those that booked for the 1st Icicle Refrozen Balloon meet. Sadly the weather meant no flying could take place, but the event was very well supported by balloonists and trade-stand exhibitors. A fabulous dinner was enjoyed by 111 people with Per Lindstrand as the honoured guest and after-dinner speaker. Cameron Balloons had a stand as did the all new Lindstrands however they didn’t have anything on display as they want to ensure that all is done and dusted before presentation. Fair enough. They did have their new appything that allows you to design your own balloon and produce rather neat visuals that can be presented to a potential client. This was showing way down inside an inflatable Time Tunnel wotsit. Nice one. You’ll need to go to Lindstrand Technologies website at http://www.lindstrandtech.com or mail them at sales@lindstrandtech.co.uk to find out more. Naturally there were all the usual stands selling everything from books and maps to glassware and, tucked away in a swish room with a chandelier and huge cast iron radiator, Zebedee’s Mr Bish and Co, about to depart for Italy! 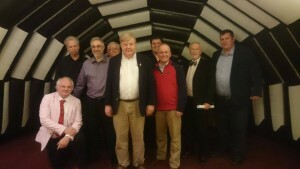 The rather smashing piccie is the Organising Committee, together with dour Per, about to enter the Time Tunnel along with Colin Butter, Peter Gray, Robin Calvert-Fisher, Stephen Harris, Jonathan Harris, Nick Bland and Geoff Lescott at Donnington Grove Country Club. Next year’s Unfrozen will be held over the weekend of the 7-8 January 2017 back at Donnington Grove Country Club. Keep an eye on the 3.4.40’s website for more information but if you want to stay on site be warned that half the rooms for 2017 have gone already! Be there or be square (talked about, in proper parlance). The CAA has just published General Exemption E 4127 within the Official Records Series 4, number 1146. This is applicable to ALL UK licenced balloon pilots. Without it, the continued use of a UK national balloon licence (rather than a Part-FCL licence) would be in contrary to the UK ANO. This General Exemption regularises the situation until 8th April 2018. It is therefore very important that you have a copy. You are welcome to cut and paste from here or go directly to the CAA link and download a copy. Strictly speaking (especially if flying abroad) without it your current UK licence is invalid. 1) The CAA, pursuant to article 242 of the Air Navigation Order, hereby exempts any person identified in paragraph 2, subject to the conditions specified in paragraph 4, from the requirements referred to in paragraph 3. 2) This exemption applies to any pilot flying an EASA aircraft that is registered in the United Kingdom for which the pilot would be required by the EASA Aircrew Regulation to hold a LAPL, SPL or BPL and in respect of which the United Kingdom has issued a derogation under Article 12 of the EASA Aircrew Regulation from the requirement to hold such a licence and where the derogation has not expired or been revoked. 3) Article 50(1) states that a person must not act as a pilot of an EASA aircraft that is registered in the United Kingdom without holding an appropriate licence granted, converted or rendered valid under the EASA Aircrew Regulation. a) That the person acting as the pilot of the aircraft (other than a glider where the glider is flying on a private flight or aerial work which consists of instruction or testing in a club environment) holds a valid pilot licence granted by the CAA or rendered valid under article 62 or the CAA has issued a certificate of validation under article 78, which renders the pilot’s licence valid for the flight and that the licence would be an appropriate licence for the purpose of article 50A if the aircraft was a non-EASA aircraft on the flight. c) other terms used have the same meaning as in article 255(1) of the Air Navigation Order unless otherwise specified. 6) This exemption shall have effect from date it is signed until revoked or until the relevant derogation/s expire or are revoked. The purpose of this exemption is to exempt pilots from the requirement to hold a Part-FCL licence in order to fly a UK registered EASA aircraft within the privileges of the LAPL, SPL or BPL. The 2012 ANO 2009 amendment requiring pilots to hold a Part-FCL licence when flying a UK registered EASA aircraft was itself amended in March 2015. This makes use of a derogation available until 8th April 2018 under Article 12 of EU Reg 1178/2011. Accordingly, the United Kingdom has filed an Article 12 derogation from the requirement to hold certain Part-FCL licences and ratings, provided the pilot holds a valid and appropriate UK pilot licence that would be required for the flight in question if the aircraft was a non-EASA aircraft. For pilots of EASA (and non-EASA) gliders registered in the UK engaged involved in private flight or aerial work consisting of instruction or testing in a club environment there is no current requirement to hold a pilot licence. We were privileged to nip up to Cardington just before Christmas to inspect the latest Sackville home-built balloon. Cardington’s Number One hangar is all now finished and it looks fantastic inside and out and somehow Tim Wilkinson got the owners to let them use it for a test inflation. Say no more! A few days before we turned up they had laid a new floor that is perfect. Occupying one end is the top secret Hybrid Air Vehicles airship now filled with helium whilst the other is a vast clean freshly decorated cavern, perfect for the first inflation of an all-new hot air balloon. We elected to take grandson Charlie who was rather in awe of the huge building but declined from walking along the upper walkway! John Russon is the latest to take up the home-built challenge having decided that he to wanted a balloon free from nonsense. Deciding to go that one step further he decided he’d have a go go at designing one but soon realized that was going to bit of a jolly job so called up Brian Mead, a whiz with CAD, to help him. After a great deal of shifting slicing and sorting Brian finally got a design together using one and half metre fabric and printed off the patterns. It was then down to the combined efforts of Needles Wilkinson, Barry Newman and John R to cut out and sew together the assorted pile of fabric. Registered G-JRLR with serial number JR01 it is described as a Sackville BM-65, the BM standing for Brian Mead, and built by 'Russon JS'. Fortunately for John his missus is called Lisa and his kids are Jonah and Lilia so depending who is about that’s what the registration stands for. We favour Jonah Russon and Lilia Russon. Neat. It has to be said that Brian’s 12 gore design is very, very, pretty although Brian did say he wanted his next design to be less bulbous we thought it was pretty much spot on. What is really nice to see is that this marks the turn for home-builts seeing’s it’s the first of the new design of envelope as opposed to a copy or rebuild of an existing design. 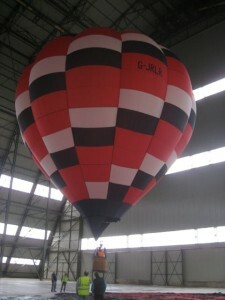 Now we look forward to seeing home built balloons following the light-weight route. Tim Wilkinson has already come up with a novel light-weight basket design that, although further development is possibly needed, does actually seriously challenge both the Ultramagic and Cameron types. Brian Mead, it is rumoured, is already designing another envelope to be stitched up in someone’s front room. The manufacturers’ need to watch this space that’s for sure. As for Brian Mead, who checked out at Sackville in 2014, we reckon his future is assured. Recorded hours on G-INFO, the CAA Aircraft Registration Site, was to the 31st December. This has now changed and in future the recorded hours will be those at the time of the issue of the Airworthiness Review Certificate (ARC) which amazingly makes a lot of sense and means one less box to fill in for the inspector however it still remains optional when submitting the ARC details to the CAA. Justin Lane of Bristol Safety Ltd has announced the following dates for their very thorough one-day Fire & First Aid Courses for 2016. The courses are designed to meet the requirements of CAP 611 for Commercial Pilots and Ground Crews but are open to all and are recommended. The course will held at The Batch Community Centre, Park Road, Warmley, South Gloucestershire BS30 8EB and run from an unearthly 08.45 finishing at 14.00. Confirmed dates are Friday 11th March, Friday 24th June, Tuesday 20th September, Thursday 8th December. In addition sessions in between these dates for a minimum of 4 attending can be arranged. Session costs are typically £99.00 per person. Dave Such has now got the official note, terms and conditions for the 20% discount 2016 DFDS Channel Crossings which British Balloon & Airship Club (BBAC) members can enjoy. The discount code is BALLOON 20 but you do need top read to end to make sure you meet the Terms and Conditions. Gemma Phillip's (DFDS Group Sales) has clearly advised the terms, conditions and any restrictions that apply to the discount DFDS Group Sales have kindly agreed to offer us again for 2016 travel. (a) This offer is valid for current BBAC members only. (b) BBAC membership number must be provided at time of booking. (c) The BBAC member whose membership number is given at time of booking needs to actually travel in the vehicle the 20% discounted fare has been applied to. (d) BBAC membership card must be carried at time of travel (evidence may be requested). (e) The 47 kg maximum allowance per reservation (remember this can be spread between unlimited cylinders) must not be exceeded under any circumstances. It could only take one person thinking they are being "clever" to jeopardise what we have been given. Discounts are only valid for travel between 4th January 2016 and 16th December 2016 and subject to availability at time of booking. They are valid for both single and return journeys on both the Dunkerque and Calais route. Valid for cars, motorhomes, vans and trailers/caravans (trailers/caravans can be towed on any of the stated vehicles). Valid for BBAC members only. BBAC membership number must be provided at time of booking and carried at time of travel (evidence may be requested). The 20% discount is only applicable to the online economy fare. Bookings must be made by email to travel.sales@dfds.com. Discount cannot be used against premium tickets. Cancelled booking are non-refundable but fully amendable. Amendments to dates and times will incur a £10.00 amendment charge per sail leg plus any increase in fare. Please note that here is only limited availability on peak days (Friday and Saturday from Dover, Saturday and Sunday from France) between the following dates. Easter between 24th March and 10th April 2016, Whitsun between 27th May and 5th June 2016, Summer between 22nd July and 4th September 2016. Although quite a smart looking bit of kit replacing hoses on the Kubicek Ignis burner was, to put it bluntly, a pain as it meant the block had to be dropped out of the lower can body and this is a billet of aluminium of some stature. Being rounded in every direction it is also a devil of a job to clamp up in order to get the hose undone. The reason it was so tricky was that there was insufficient room to get a decent ring spanner around the fitting which depends on a Dowty for sealing. Now replacement hoses come with a pre-wrapped parallel thread that appears to be a tapered one but removing the wrap it is in fact a serrated parallel (thread appears damaged) which picks up the PTFE to ensure a seal with a fitting you can get a spanner around and no Dowty is used. The original Dowty type is on the right. We were understandably confused at first as the new hoses came with no advisory notes as to the change but a few emails later and with the language problem addressed all was sorted. Be aware that when fitting them that unlike a Dowty seal or copper washer to tighten against all that you are relying on is the compression of the PTFE wrap so it is very important that a very careful leak check is carried out. No torque figures are given so tight but not over-tight is all we can really say. Presumably all new Ignis burners come with the new fittings. Please note that Kubicek use metric threaded fittings unlike the other manufacturers who mainly use Imperial fittings. Recently released figures for 2015 aircraft deliveries show that Big Boys Boeing were beaten by EASA-sponsored Airbus whose order books stand at one trillion dollars but whose delivery schedules are way behind! Airbus ended up with 1,036 orders after cancellations, down 29% from 2014, compared with Boeing's por showing of 768, a fall of 46%. This was somewhat predicable following two years of strong selling, the general economy and low oil prices affecting the demand for fuel-saving aircraft. Across the board the popular models continued to sell well for both companies with Airbus delivering 635 aircraft, a figure predicted to grow to 650 this year but still short of fulfilling orders. In contrast Boeing delivered 762 aircraft up 5% and a company record. Interesting planes to watch this year will be the increasing sales of wide body jets where the Dreamliner is now dominating new sales and the Double-decker Airbus sales of which are falling very short of predictions and it likely that production may cease in the next couple of years. The final fate and fortune of the Cameron Balloon Flights Southern Ltd (trading as Go Ballooning and Go Vouchers) customers and creditors are now to be decided during the Final Meetings in February. J Sadler of Elwell, Watchorn and Saxon has just sent out notice of the Final Meetings of members and creditors which have been convened for 26th February 2016. The Meetings are purely formal and are held for the purpose of receiving the Liquidator’s final progress report on the conduct of the winding-up. The legislation requires that before he can issue his final report he must confirm that no dividend or no further dividend will be declared in the case and the funds realised have been used to meet the expenses of the insolvency process. The draft final report, together with appropriate notice and a form of proxy for use at the meetings, if required, are available for viewing or downloading on the internet. The report can be accessed by going to EWS’s website www.ewslip.co.uk and entering the password cf58su72ww (case sensitive). If you require a hard copy (foc) please contact EWP LLP, 109 Swan Street, Sileby, Loughborough, Leics LE12 7NN tel 01509 815150 or email Leicester@ewslip.co.uk. The British Balloon Museum & Library have announced Saturday 7th May 2016 as their next Inflation Day which will be held at Pidley Golf Course. If you’ve never been to one or have a bag of rotting, mildewed fabric in the shed that amy or may not be the remains of an old balloon you need to get along to it. Complementing the Old and Rusty Balloons will be Old and Rusty pilots, crews and spotters who will recount tales of yesterday year and how they took off from Cirencester in winds approaching 40knots without a fan, cover or quick release with 10kg of propane, box of matches and ham sandwiches wrapped in greaseproof paper ending up in large wasps nest in the Lion enclosure at Whipsnade Zoo. Highlight of 2016 will be the spectacle of all four Chubb Balloons being inflated and the appearance of G-BAIR ‘Jumpin’ Jack Flash’. They is bound to be a super duper cake and a raffle with prizes such as historic bits of broken tile, bent and a left hand flying glove recovered from the Lion enclosure. How could you not go? Why would you not go? 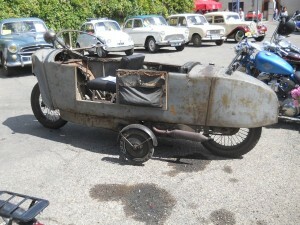 For details, an entry form or to donate suitable raffle prizes go to the BBM&L website at www.bbm&l.org.uk. Be there or have a jolly hockeysticks excuse. The full address of the venue is Lakeside Lakeside Lodge Golf Course, Fen Road, Pidley, Cambs PE28 3DF. Onsite camping or accommodation is available. Please book through their website at http://www.lakeside-lodge.co.uk/ or email reception@lakeside-lodge.co.uk. Now this made me cry I laughed so much. Ladybird Books have published a new adult series of Ladybird Books one of which Bazzer acquired for me from our favourite gin, beer and music venue, Blackwell's Bookshop entitled "The Shed". If you are a shed person then you will reluctantly have to agree that it very accurate so treat yourself . If not get it for a shed bloke and have a read through and you will convert. It really is brilliant and has pictures illustrating the simple phrasing probably painted by the same artist that did Flight Three – United States of America. A Health warning should be attached and don’t let the missus read it. If you are the missus then you will quietly agree that it is all true. Although subject of a future article entitled ‘Really dreadful things I’ve bought’ I felt we had to include this picture of a fantastic creation that David Barker sent us from France. We’ve no idea what it is nor where it was made but it is clearly a wonderous creation and no doubt from the same barn as our recently acquired Terrible Terrot more on which later. The French are actually very good at making things that look out of date or conversely starred in a Buck Rogers episode so we are guessing this is probably late fifties early sixties. Any help would be appreciated so we can make an offer. 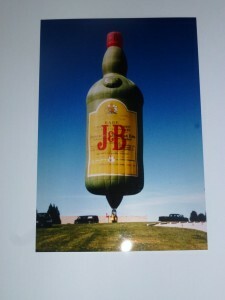 Fellow Old & Rusty Nick Godfrey is seriously thinning down his balloon collection including the J&B Whisky Bottle. This one is G-OJBW a Lindstrand Special Shape rated as a ’90 and built in 1997 and not flown for a while now. Total hours are between 30 and 70 but we (or Nick) have misplaced the logbook but it might have gone to the Balloon Museum. We all continue to search. It is in exceptionally good condition (like minted) and will be sold with a new ticket and ARC. At the moment its safely stored in the workshop awaiting a nice calm cold clear morning to test inflate it. Asking price is around £5500. The artwork can stay as is. Additionally Nick is also selling an amazing pin collection including all the Albuquerque Special Shape Rodeo Medals from the year dot. Contact Nick by mobile 07931 511932 or email nick.godfrey4@googlemail.com.